A jury debates the fate of a young man on trial for murder. If he is found guilty, he will face the death penalty. "Look, you know how these people lie! It's born in them." And, "They don't know what the truth is! And lemme tell ya: they don't need any real big reason to kill someone, either!" And, "They're sending people that have lots of problems...They're bringing drugs. They're bringing crime. They're rapists." And, "I've known a couple who were OK, but that's the exception, y'know what I mean?" Alright, so maybe one of those phrases wasn't from the movie, but with all the generalization going on, it's hard to tell which quote is not from the film and which one was uttered by a real person. That's scary as hell, especially considering the character that spoke the majority of the above lines is meant to be a despicable bigot. We remain supremely enthralled by the debates that rage on in the jury room in "12 Angry Men." The sharp dialogue leaves us hanging on every word. It's all about one man standing up to immense social pressure when encountering something he knows is wrong and demanding that the issues at least be discussed. We will admit, the actions taken by the jury aren't exactly accurate as they essentially retry the case themselves with Henry Fonda's Juror #8 acting as a makeshift defense attorney for the accused. He regularly presents new evidence not offered by the defense and debates that instead of what's already been presented. We suppose this may be to point out the regular failings of the overworked public defender's office, but we digress. The film does point out that those who cannot afford their own attorney often don't get competent representation due to public defenders being overworked and understaffed. Apart from the enthralling nature of the film, the acting here is fantastic as these 12 men each represent different ideologies, mindsets, and backgrounds. We have to admit though, every single time John Fieldler started talking, we couldn't help but imagine Piglet from "Winnie the Pooh" debating this murder case. 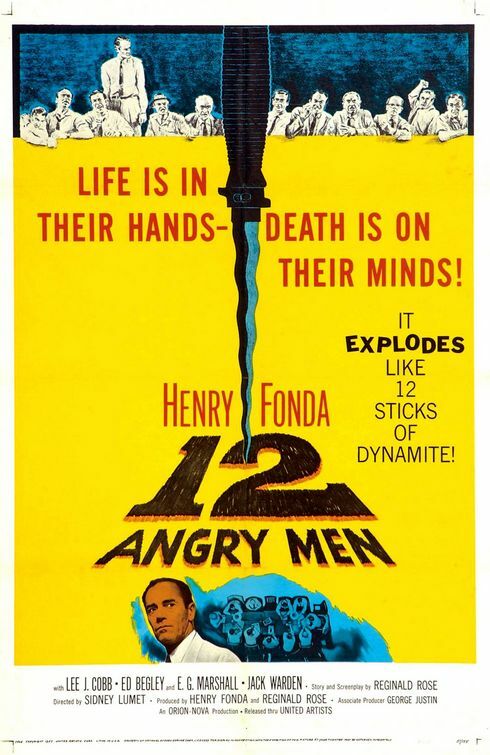 "12 Angry Men" is one of the most important films ever made. This is a movie that should be shown in every school, at every grade, all across America, from kindergarten through law school. It holds up very well and it is still just as good today as it ever was. Stunning work by Sidney Lumet!